You can select a variety of additional layout and printing options for your document or photo on the More Options tab. Select the Fit to Page option to size your image to fit the paper you loaded. Select the size of the your document or photo as the Document Size setting, and the size of your paper as the Output Paper setting. Select the Zoom to option to reduce or enlarge your document or photo by a specific percentage. Select the percentage in the % menu. Select Automatic to automatically adjust the sharpness, brightness, contrast, and color saturation for your image. Select Custom and click the Advanced button to manually adjust the color correction settings or turn off color management in your printer software. 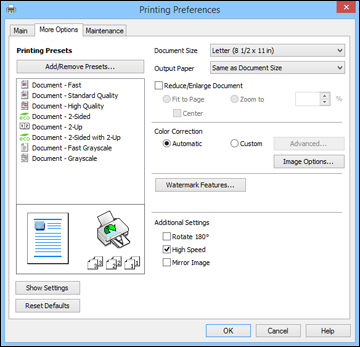 Select Image Options to access additional settings for improving printed images. Anti-Copy Pattern: adds a watermark that only appears when your printout is copied. Watermark: adds a visible watermark to your printout. Header/Footer: adds information such as the date and time to the top or bottom of your printout. Note: Click the Settings button to customize the text and location of the header or footer. Select any of the Additional Settings options to customize your print.